In early February 2018, Syrian regime forces moved to take over oil fields near Dayr Az Zayr that U.S.-backed fighters from the Syrian Democratic Forces group had seized from Islamic State in September 2017. The United States responded with a devastating bombardment that killed scores of pro-regime troops. The Syrian force was a hodgepodge of available militias. According to unofficial reports, it included nominally “loyalist” controlled by Liwa Al Baqir, a Syrian group answering to Iran’s Islamic Revolutionary Guards Corps. Liwa Al Baqir recently formed three battalions — one each in the villages of Mazlum, Marrat and Al Hatlah in Dayr Az Zawr province. Such groups are usually staffed by locals, but commanded by IRGC officers. Additional unofficial sources cited the presence of the IRGC’s Liwa Fatimiyoun, too. This is a division-size unit staffed by up to 20,000 young Afghan Hazara refugees, many of whom were forcefully recruited in Iran. 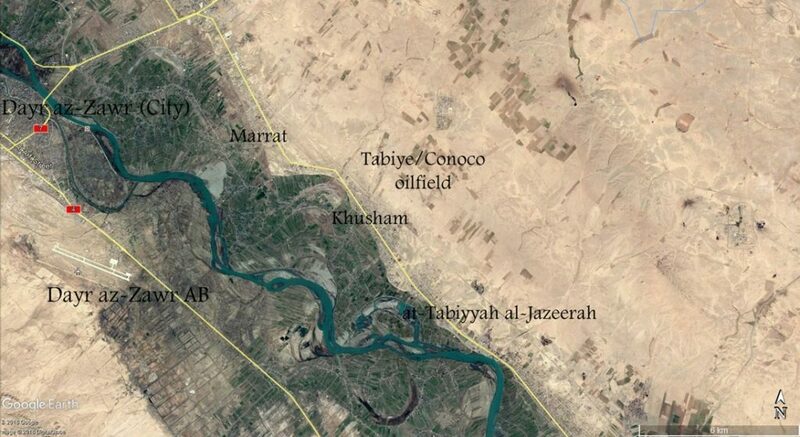 The Syrian regime reportedly had been negotiating with Kurdish groups for a peaceful handover of the oil fields. But the SDF’s council in Dayr Az Zawr rejected the handover. When regime forces approached the SDF’s front line with intention of taking over, around midnight on Feb. 7 and 8, 2018, the SDF requested help from U.S. Central Command. The U.S. military reacted in a particularly vicious fashion. In a matter of only three hours, it deployed more firepower in one, relatively small area north of Dayr Az Zawr than the Russians, the regime and the IRGC managed to concentrate in all of Idlib in January 2018. The combined IRGC forces in the area between Marrat and Khusham were subjected to sustained air strikes by U.S. F-22s, F-15Es, AC-130s and AH-64s. U.S. Marine Corps artillery added to the bombardment. According to the Pentagon, at least 100 pro-regime combatants were killed. Unofficial sources in Syria claimed up to 150 casualties, while one of SDF’s spokespersons claimed the destruction of more than 20 vehicles, including nine tanks. Unofficial sources in Syria confirmed the death of at least 61 “members of the Syrian armed forces,” including around 25 combatants from “local tribes” – who were reportedly told by their Iranian commanders that they were about to attack an ISIS sleeper cell. Despite U.S. reports about the possible involvement of Russian forces, unofficial sources in Lebanon insisted that no Russian or Hezbollah troops were among the victims of U.S. strikes. The truth about Iran’s losses will become obvious only when the “victims” in question are laid to rest in places such as the Beka’a Valley in Lebanon or Qom in Iran. Moscow and Damascus bitterly complained about Washington’s “aggression” and the “illegal U.S. military presence in Syria.” The regime went as far as to accuse the United States of a war crime. What’s indisputable is that, in attacking pro-regime troops near the Dayr Az Zawr oil fields, the United States openly clashed with an Iranian-controlled group.